Director – Mikael Håfström, Screenplay – Scott Alexander, Matt Greenberg & Larry Karaszewski, Based on the Short Story by Stephen King, Producer – Lorenzo di Bonaventura, Photography – Benoit Delhomme, Music – Gabriel Yared, Visual Effects – Baseblack, Lip Sync Post (Supervisor – Samantha Tracey), The Moving Picture Company (Supervisors – Matt Hicks & Uel Hormann) & The Senate Visual Effects (Supervisor – Simon Leech), Special Effects Supervisor – Paul Corbould, Makeup Effects Supervisor/Designer – Karl Derrick, Production Design – Andrew Laws. Production Company – Dimension Films/Lorenzo di Bonaventura. Mike Enslin has written a series of books about various haunted hotels, graveyards and lighthouses, although is himself sceptical about the existence of ghosts and the paranormal. He receives an anonymous postcard telling him to visit Room 1408 at New York’s Dolphin Hotel. Hotel management refuse to let Room 1408 out and Mike has to use a lawyer to be able to rent the room for a single night. Manager Gerald Olin does everything he can to persuade Mike not to spend the night, including mentioning how the room has been responsible for the deaths of 56 people and that nobody has been able to stay for more than an hour. Mike ignores this and signs in but soon finds that the room is very much haunted. Unsure whether or not he has been drugged, he tries to fight against the room’s attempts to play with his head and make an escape. 1408 was a horror film that arrived with an impressive advance buzz – ‘Best Horror Film of the Year’-type reviews and the like. Swedish director Mikael Håfström is an impressively rising newcomer who previously appeared in the English-language mainstream with the banal thriller Derailed (2005). He had previously made a number of works in the horror genre in his native Sweden with the tv mini-series House of Shadows (1996), the film Drowning Ghost (2004). Subsequently, he returned to genre material with the exorcism film The Rite (2011) and went onto the non-genre Sylvester Stallone-Arnold Schwarzenegger prison break film Escape Plan (2013). 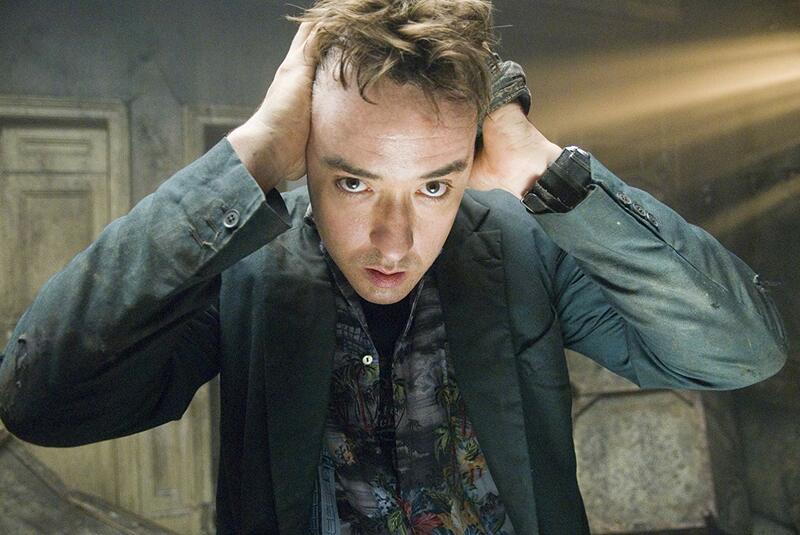 Mikael Håfström sets out to craft 1408 as a solid and satisfying scareshow. Indeed, 1408 emerges as a textbook example of what a classic ghost story should be. Håfström shrewdly throws out everything that has polluted the horror film in recent years. This is no ghost story with artistic pretensions pretending that it is not a horror film; there are no contrived pop-up or CGI scares; no attempts to keep jolting an audience with amplified jumps on the soundtrack; no good-looking teen stars; no genre in-referencing irony or characters making smartass wisecracks. 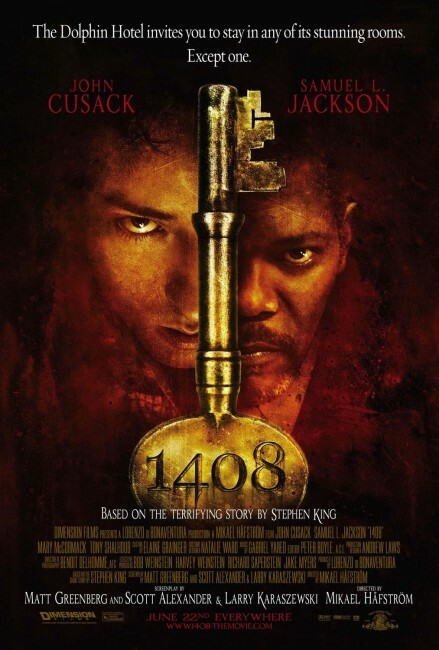 Instead, 1408 is a horror story that takes things back to basics. Mikael Håfström conducts a near-perfect lead-up to arriving at the room. We are introduced to John Cusack as a bored, sceptical hack on the ghost writing circuit, patently not believing in what he writes about. This comes in marked contrast to his signing in at the Dolphin Hotel where Samuel L. Jackson (giving a characteristically fine performance) underlines the threat of the room in terms of gravest warning. 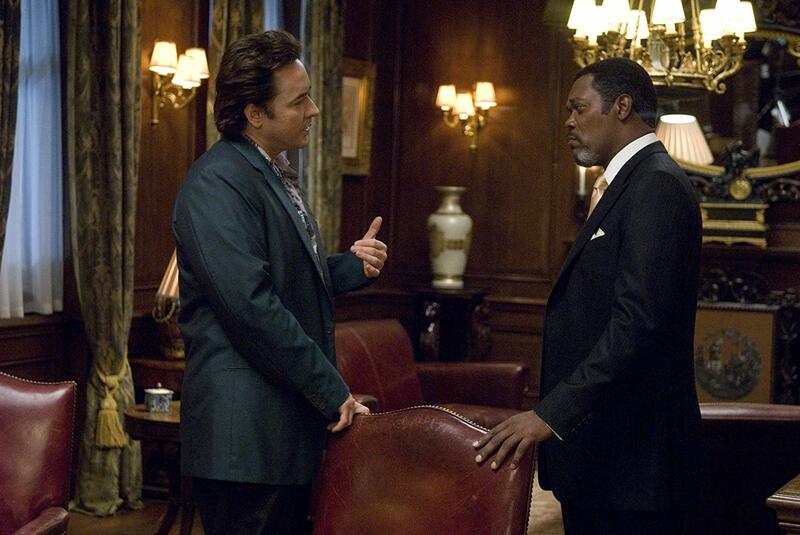 In this pair-off between Cusack and Jackson, there is a level of writing and acting that gives 1408 a palpably charged frisson and threat of bad things about to happen without even a single supernatural event having transpired. On the other hand, in complete contrast to the dire warnings that Samuel L. Jackson provides, the entry into the room comes with an utter dullness. The room is the most banal and ordinary hotel room possible, which serves to completely undercut the threat but at the same time leaves every tiny happening looming with the imminent sense that anything could happen at any second. Nothing else in the film subsequently matches the degree of tension that Mikael Håfström inflates and then carefully deflates in us during these scenes. The bulk of the film consists of Mikael Håfström assaulting us with various manifestations from the room as John Cusack variously deals with cracking and bleeding walls, ominous alarm clocks, being attacked by window panes, frozen by subzero temperatures, nearly drowned as the oceans from a painting of a ship at sea come flooding out, dealing with sinister reflections on windows across the street or more amusingly mundane happenings such as toilet rolls that are mysteriously turned down and courtesy chocolates that appear on the pillow. Not to mention the radio that keeps turning on and with appealing sarcasm playing The Carpenters’ We’ve Only Just Begun (1970). The most intensely sustained part of the film is a hair-raising sequence where John Cusack must crawl along a ledge only a few inches thick to try and get to the next room, only to find out that every other window on the fourteenth floor has mysteriously vanished – a scene that reminds considerably of the Stephen King short story The Ledge (1976), which was filmed as an episode of Cat’s Eye (1985). There is a point about three-quarters of the way through where Mikael Håfström pulls back to make us think that everything that has happened in the hotel has all been an hallucination being had as John Cusack was nearly drowned while surfing. One groans as it feels as though 1408 is about to head down the path of a twist ending that has been overly used in a number of films in recent years – see Siesta (1987), Jacob’s Ladder (1990), A Pure Formality (1994), The Others (2001), Soul Survivors (2001), Hidden (2005), Reeker (2005), Stay (2005) and in particular The Sixth Sense (1999) – which reveal that everything has been a dream while the protagonist lies between life and death and/or that they are dead. However, the screenwriters then invert this, showing this to have been another illusion created by the hotel room. I am not entirely sure if the film needed this – it feels contrived. Indeed, much of what happens in the last quarter of the film has the feel of having extruded events to fill out running time. One surprising aspect is that there is less in the way of ghostly phenomena than one might have thought – the film spends almost no time dealing with the ghosts of the past or explaining what caused the room’s evil presence. Most of the show (aside from Samuel L. Jackson’s show-stealing appearance at the start and occasional scenes from the underrated Mary McCormack) are carried by John Cusack in what is fairly much a one-man show. Indeed, 1408 is an admirable case of minimalist horror with the entire story fairly much being constrained to three rooms and carried by one actor. The one thing that Stephen King understands that most modern ghost story films do not is the evocation of a psychological relationship between the hauntee of the story and the various supernatural phenomena. Look no further than Stephen King’s most famous ghost story The Shining (1977), a modern classic that is as much about a man dealing with the demons of alcohol than it is about the haunted Overlook Hotel. (Many were quick to draw connections between 1408 and The Shining – both being set in haunted hotels – although 1408 works well enough on its own without needing to be seen as The Shining Redux). The results are one of the most solid and satisfying ghost stories that one has sat through in some time. Screenwriting team Scott Alexander and Larry Karaszewski had gained a high profile with biopics like Ed Wood (1994), The People vs Larry Flynt (1996), Man in the Moon (1999) and Big Eyes (2014), as well as children’s fare like Problem Child (1990), Agent Cody Banks (2003) and Goosebumps (2015). Co-writer Matt Greenberg has a number of genre credits to his name with screenplays for The Killing Box/Ghost Brigade (1993), Halloween H20: Twenty Years Later (1998), The Prophecy II (1998), Reign of Fire (2002), a further Stephen King adaptation Mercy (2014) and Seventh Son (2014). Other Stephen King genre adaptations include:- Carrie (1976), Salem’s Lot (1979), The Shining (1980), Christine (1983), Cujo (1983), The Dead Zone (1983), Children of the Corn (1984), Firestarter (1984), Cat’s Eye (1985), Silver Bullet (1985), The Running Man (1987), Pet Sematary (1989), Graveyard Shift (1990), It (tv mini-series, 1990), Misery (1990), a segment of Tales from the Darkside: The Movie (1990), Sometimes They Come Back (1991), The Lawnmower Man (1992), The Dark Half (1993), Needful Things (1993), The Tommyknockers (tv mini-series, 1993), The Stand (tv mini-series, 1994), The Langoliers (tv mini-series, 1995), The Mangler (1995), Thinner (1996), The Night Flier (1997), Quicksilver Highway (1997), The Shining (tv mini-series, 1997), Trucks (1997), Apt Pupil (1998), The Green Mile (1999), The Dead Zone (tv series, 2001-2), Hearts in Atlantis (2001), Carrie (tv mini-series, 2002), Dreamcatcher (2003), Riding the Bullet (2004), ‘Salem’s Lot (tv mini-series, 2004), Secret Window (2004), Desperation (tv mini-series, 2006), Nightmares & Dreamscapes: From the Stories of Stephen King (tv mini-series, 2006), The Mist (2007), Children of the Corn (2009), Everything’s Eventual (2009), the tv series Haven (2010-5), Bag of Bones (tv mini-series, 2011), Carrie (2013), Under the Dome (tv series, 2013-5), Big Driver (2014), A Good Marriage (2014), Mercy (2014), Cell (2016), 11.22.63 (tv mini-series, 2016), The Dark Tower (2017), Gerald’s Game (2017), It (2017), The Mist (tv series, 2017), Mr. Mercedes (tv series, 2017– ), 1922 (2017), Castle Rock (tv series, 2018– ) and Pet Sematary (2019). Stephen King had also written a number of original screen works with Creepshow (1982), Golden Years (tv mini-series, 1991), Sleepwalkers (1992), Storm of the Century (tv mini-series, 1999), Rose Red (tv mini-series, 2002) and the tv series Kingdom Hospital (2004), as well as adapted his own works with the screenplays for Cat’s Eye, Silver Bullet, Pet Sematary, The Stand, The Shining, Desperation, Children of the Corn 2009, A Good Marriage and Cell. King also directed one film with Maximum Overdrive (1986). (Nominee for Best Actor (John Cusack), Best Supporting Actor (Samuel L. Jackson) at this site’s Best of 2007 Awards).